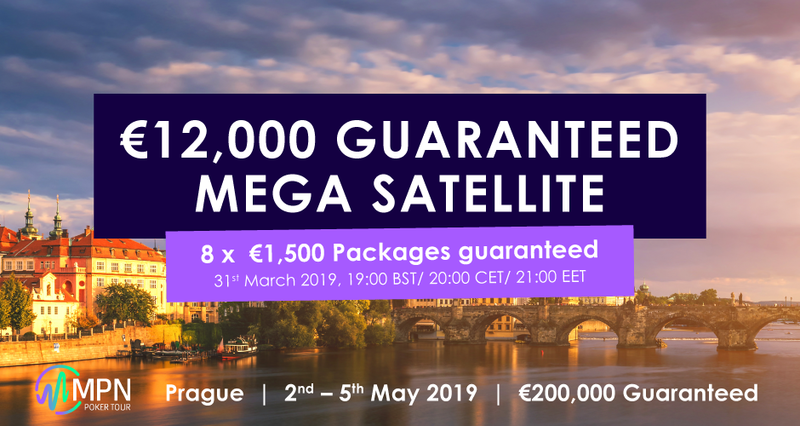 The second MPN Poker Tour festival of 2019 will see our first visit to the beautiful city of Prague from 2nd-5th May and offer players a €200,000 guarantee for a buy in of €550 on the Main Event. Come and experience live poker at it’s best! Main event packages are available online now costing €1,500. Packages can be purchased using either cash or loyalty points. Online satellites begin on 21st January and ends on 28th of April. You can qualify online satellites with buy-ins as low as €1. You can also buy or win a seat only in the Main Event for €550 through the poker client or qualify via the seat only satellites. If you win more than one seat, you can use the second seat as a re-entry ticket or transfer it to another player. *Players will have a choice of main event starting day; Day 1A May 2nd or Day 1B May 3rd. **You may transfer your side event ticket to a guest if you wish. If you do not transfer your side event ticket but are unable to play because you’re still playing the main event, you can get a refund from the casino cash desk. Otherwise, the side event entry is not refundable or exchangeable. ***After your confirmation by e-mail will be credited to your OlyBet account. Good luck at the tournaments and see you in Prague!